A detailed packing list for Scotland. All the essentials you have to bringt to enjoy the Highland & beyond. Scotland is an amazing country. It’s so easy to have the time of your life there. 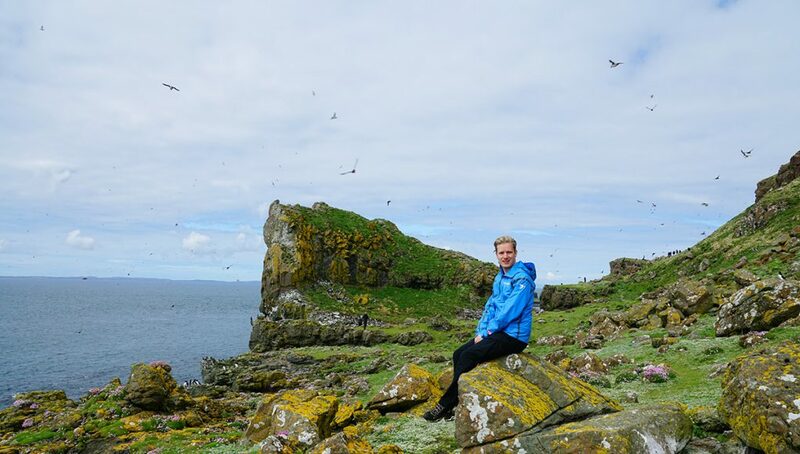 Just check out my list on 20 amazing things to see in Scotland to get a good impression. Since most activities in Scotland are outdoors and the Scottish weather is a bit, shall we say fickle, it’s a wise idea to think ahead. 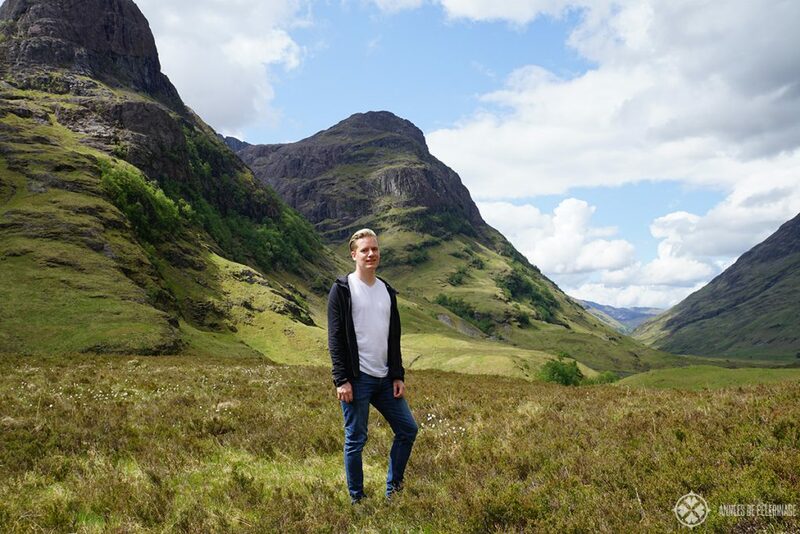 Here’s what to pack for Scotland and also what you should probably leave at home. 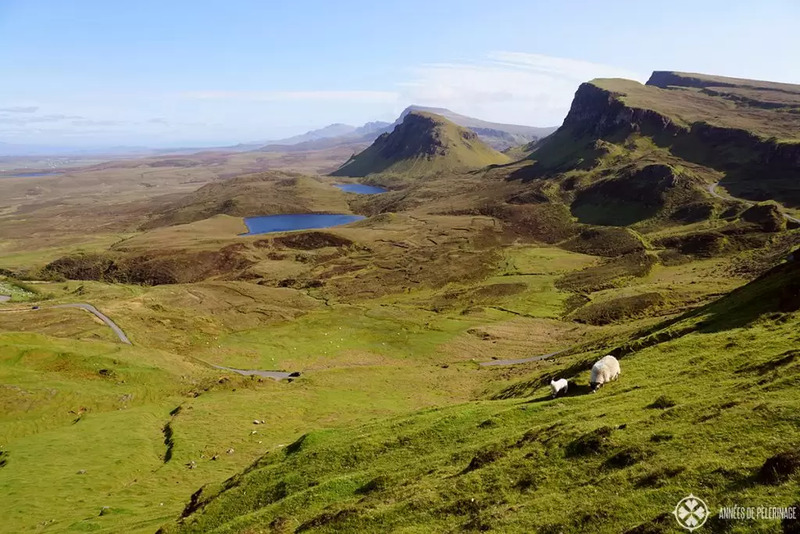 First of all, Scotland can roughly be divided into the Lowlands (meaning Edinburgh and Glasgow) and the Highlands. 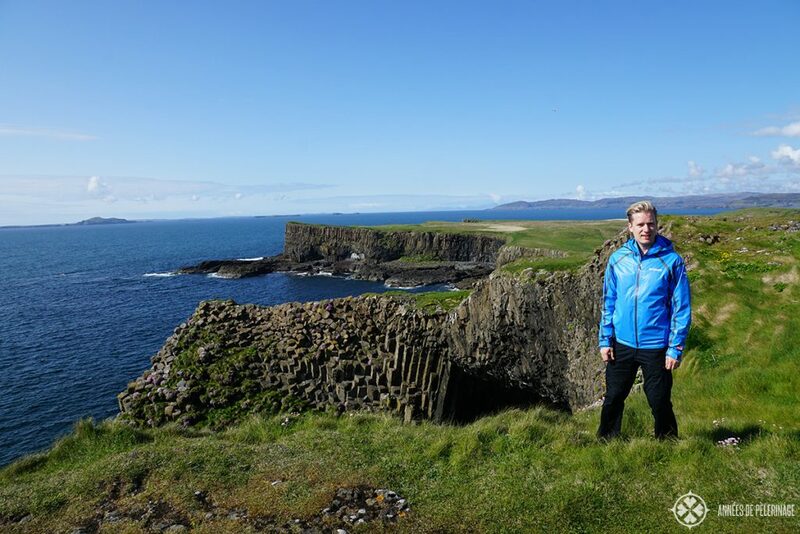 You will probably want to see the Isle of Skye (if it’s not on your list yet, read my guide to the Isle of Skye!) and the big cities. The climate in both areas is a bit different, though the general pattern prevails: Scotland is cold and wet. 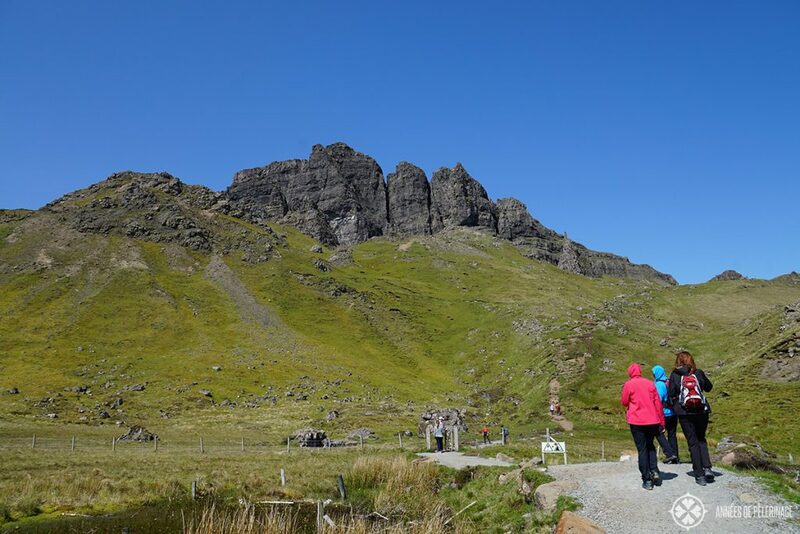 Even in May, you will have 11 days of rain in Portree on the Isle of Skye – and that is the driest Month of the year. In December it will be 20. July generally sees the highest temperatures, but it’s a rare day you will see temperatures above 17° Celsius. On a cold and rainy day, temperatures around 10° Celsius are more likely. Edinburgh is a bit milder. With temperatures climbing up to 19° Celsius in Summer and an average of 9 days of rain (winter is 12). The good news: The Scottish winter is quite mild. Actually, you shouldn’t even be expecting minus degrees. The bad news: There is no summer. A local once joked to me on a particularly fine sunny day in May that they didn’t expect summer to be on a Tuesday this year. Even then it will still be somewhat cold. If you take a closer look at the pictures below, you will mostly see me wearing rather warm stuff despite the splendid sunshine! Apart from the weather, it pays off to consider the rugged Scottish landscape. Edinburgh, Glasgow, and Aberdeen are the only cities worth their name. If you want to go shopping or clubbing, better choose another country. 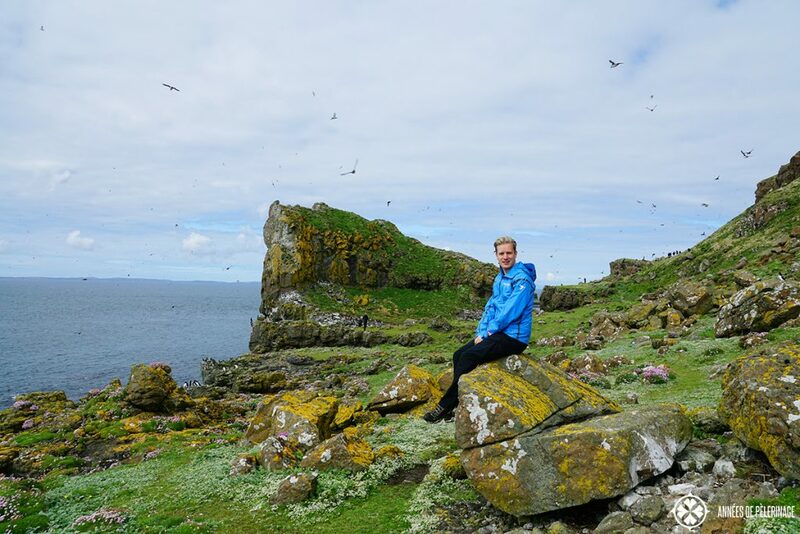 Scotland is all about amazing landscapes, wildlife experience and beautiful castles (here’s my list of the most beautiful ones in Scotland). Thus, you really should think practical and not like a fashionista. Your beautiful suede boots will not look as pretty after walking through a bog. You know, I don’t really love walking around in trekking pants and hiking shoes either. BUT they were created for a reason and having an outdoor adventure in Scotland was one of them. Note: I get commissions for purchases made through links in this post. I do not recommend products I have not reviewed thoroughly myself. Even in summer, you really don’t need to bring a bathing suit. There are some really pretty beaches in Scotland (especially out on the Isles), but water temperatures are usually so low, that a day out on the beach is nothing you can be looking forward to – at least not to go bathing. Like I said, you will be on the road and outdoors, so you really don’t need to bother which necklace you want to bring. In fact, chances are higher that it gets tangled below your poncho than anyone taking notice. Some other things you will definitely need. (optional) a hiking cushion; there are tons of stones around to sit – no worries, but they can be cold. As for sunglass, weird as it may sound, I’d urge you to bring some. Sun is not unheard of (as you can see on my pictures) and I like wearing them on the boat – mostly against the wind. I also took along my a dual voltage travel hair dryer – not all guesthouses will have one. But that’s just personal preference because my hair dry super slow and I hate nothing more than wasting half an hour in front of the mirror using that model from the 80ies (with a high focus on smelling of burnt hair and not so much built for its drying capabilities) supplied by the landlord. Last, but not least, you might want to consider bringing sunscreen if you are visiting during the summer months. Chances are pretty low that the sun will shine continuously, but it’s not unheard of either, especially on a boat trip. During my last visit, I actually managed to get a sunburn. A sample-sized bottle will suffice! Don’t overpack for Scotland, as most people move around a lot and it’s just super annoying if you are traveling with too much luggage. But also, a word of warning in case you plan to pack too light. While there are stores in the Highlands, it can be quite a nuisance to search for them and they might not have what you want. That’s it. That was my list of what to pack for Scotland. If you got any questions, feel free to ask them below! And don’t forget to pin this for later. this is very helpful for me as my family is travelling there in July for 10 days. I was surprised by the temperatures! its much cooler than here in the US near NYC.What is a buff? yeah it’s quite cold, especially when it rains. A buff (brandname) is a multifunctional headband. Hi, My family is heading to Scotland the first of August & this is the best advice I have found so far! I love the links to Amazon. Thanks so much! thank you for your kind words. I know what a hassle packing sometimes can be! Enjoy Scotland! Thank you Norman for your travel tips, they have been very helpful. I had no idea Scotland would be that cold during the summer! I am looking forward to it and will be prepared. Very helpful information ???? but you haven’t mentioned anything about the midges ? We’re going to Skye for a few days and wondered if they were a problem. usually the wind will keep the smaller flying critters from being too bothersome. When we were there in 2013 for World Pipe Band Championships, we packed parachute cord and clothes pins. Packing light means you may want to do some light laundry in sink or shower, and dry overnight over tub. Don’t over pack. Nobody cares that you’re wearing the same outfit twice! Thank you for the useful tips Norman! I’m from Australia and leaving in 3 days to study in Dundee, Scotland for 5 months.. time to get packing! That sounds great Daisy! Wishing you a wonderful time. I am sure you will enjoy Scotland. Thanks norman, it was really helpful..i am from pakistan and leaving for glasgow on 14th september to study there for one year.its helping me for packing right now? Love this. You gave me some great tips…like the flashlight and the extra SD Card for camera. I know this is crazy, but I am visiting Scotland in November! (Who does that???) No doubt, it will be colder than you suggested above. I am expecting nothing colder than Chicago in the winter. Would this be a fair assessment? I am not trekking the mountains, but will be touring Edinburgh, Highlands, and Skye. I have a tour guide but trip involves, walking & driving, exploring the countryside, and in and out of Castles/Abbeys. With the varied sites and in & out of car, I am not sure what exactly I need for footwear. I am bringing waterproof boots. Do I need waterproof trainers as well? I didn’t plan on anything waterproof in clothing (as you suggested above) but I do have a long, -20 degree down coat to top off my clothing. Will this be sufficient in keeping me dry and warm in and out of sites/walking tours? (Hat gloves, and scarves will be a part of the mix.) Can I dress a little less “outdoor” with my itinerary…layering coat/hat as I step outside/walking around? As a woman, I do like to look nice too. But I want to be dry and warm. Is there a balance between fashion and fighting the elements? Ha! great I could be of help. You’d only need proper boots if you do trekking, otherwise normal waterproof mountain trainers will be sufficient. We are leaving for Scotland shortly. Since we are going to some cool windy places like Skye and the Orkneys, should I bring my lightweight winter ski jacket? Or will I be too warm? Gloves, too? We will be hiking a lot and looking at old ruins, so outdoors as much as possible. Any items us gals need to bring that you may not have included? i don’t think a ski jacket is a good choice. Rather a proper rain jacket and something warm below, as this will be much more versatile. You don’t get minus degrees in Oktober in Scotland, so why bring it? You’ve answered almost all my questions! Thanks for the great packing advice but one more little detail about raincoats in the Highlands… I have a nice one with a hood and a button in liner for warmth. Will I need the liner in May? Well…the weather in Scotland is a bit fickle. Normally I’d say you won’t need a liner, but if you get one week of rain you might wish you had one. Let’s put it that way: I wouldn’t buy one and just bring a nice warm jumper to wear underneath. How about some repellent for the midges? That really depends on where and when you are travelling. 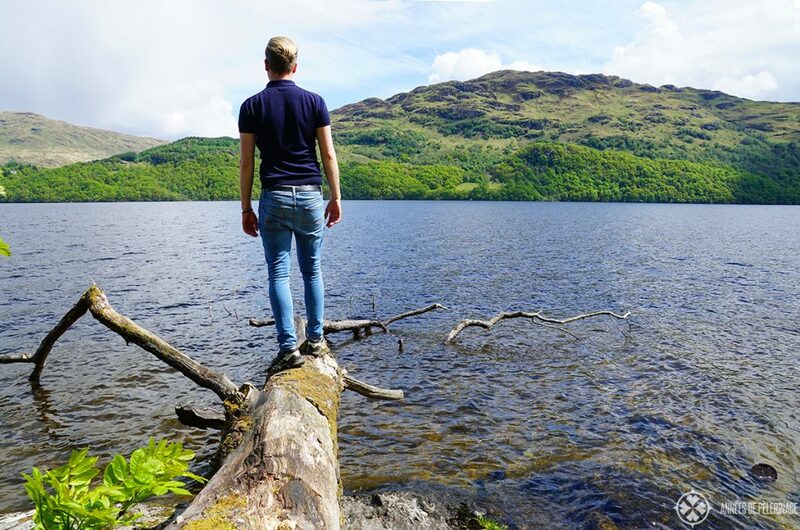 If you are visiting the Highlands in summer, then some insect repellant is needed! Great list, spot on! Even at pubs you will often see a ‘muddy boots welcome’ sign. But.. as a South Scotland loving lass my heart broke when I read “Scotland can roughly be divided into the Lowlands (meaning Edinburgh and Glasgow)…”. Thank you for the great packing list.I think your list helping me when i will go for scotland. Not only me but also everyone who wanna thinking about scotland. I must follow these tips when it will be my turn. If you had more insight i will greatly appreciate it. Thanks for the sharing such a helpful article. Thank you for the packing tips! We are thinking for go scotland in next month with my whole family. I think your list helping me when i will go for scotland. Can you recommended some place where we can visit when we are going there? Thanks for the sharing such a informative article. Wow! Very detailed! Such a good and helpful read. My family and I are planning to visit Scotland (Edinburgh and the Highlands) for 10 days. We are bringing our 2 kids ages 11 month old and 6 years old and I am so eager to know what to pack. I want to be very prepared especially bringing out two little ones. Thank you for this read. And any other recommendation or advise when bringing kids? I would really appreciate! Thanks! I’m 70 and went alone to Mull first of June, where I met up with a group of 10. Only took a carry-on and traveling crossbody that’s thief proof and converts to a day backpack. My advice is a rain jacket with a hood and baseball cap (works for men and women..hood up over or hood down. Bought my cap at a Whiskey distillery!). My jacket has multiple pockets with snaps. No umbrella! Ran into 70 mph winds but otherwise never used an umbrella. I didn’t take trekking boots just waterproof Nike’s and a spare town walking shoe. No camera, just my iPhone 8plus and a waterproof case. Extra power source for the plane and train. Dress in layers because the sun comes in and out. Sunscreen is a good idea! Don’t overpack. I brought one skirt and a scarf, a little basic makeup and meds. A folding, packable cane for walking rough terrain. I stayed at Lochbuie on Mull for 9 days and we visited islands in the area (St. Brendan’s Isle and St. Kenneth’s Inch, Iona), then Kilninian and Mull Monastery of all Celtic Saints. Last items I have food allergies and fibromyalgia so I couldn’t eat anything for 30 hours! I packed high protein bars (mine are special) and gluten free items. I had a self inflating back pillow that made the plane trip a good experience. (deflated it rolls up and fits in my purse). I left room to bring home a few souvenirs. thank you so much for your detailed comment! I only spend 2 days on Mull. I so want to stay longer on the isles – i found them so calming and could actually *breath* imagine living there! Great job Norman, I think this will help me out a great deal. Like CharmingHye wrote in July, I’ll also have a couple young kids with me (4 & 8 y/o). Any additional advice regarding kids, what they may need, etc..? I really don’t have a lot of experience with traveling with kids (though I myself traveled a lot as a kid :P). A good rain poncho for the kids and waterproof shoes is probably what you want to take (usually kids care way less about the rain than adults). Also, as you are bound to be on the road quite a bit, you might bring something to entertain them in the car. You are a life saver! My husband and I are off to Scotland for a ten day tour in three weeks and I’ve been trying to figure out what to pack. Your list was PERFECT. Thanks so much for the help. Thanks for your great and informative post. Such an important post you make that help me moe to ready my backpack. This is my second best place for outdoor gear land. We will be in Scotland in mid February. Our home base will be in Edinburgh and we will be spending time in the city but also going up into the Highlands . What typical weather can we expect and what should we wear during that time of year? There can be snow in the highlands. well, that is hard to tell. Typically, January and December count among the months with the highest precipitation. In the Highlands that can mean snow, while it will be soggy weather down low. Anyways, sorry to be so vague but it really depends on what oyu plan to do. Thanks so much for the tips. 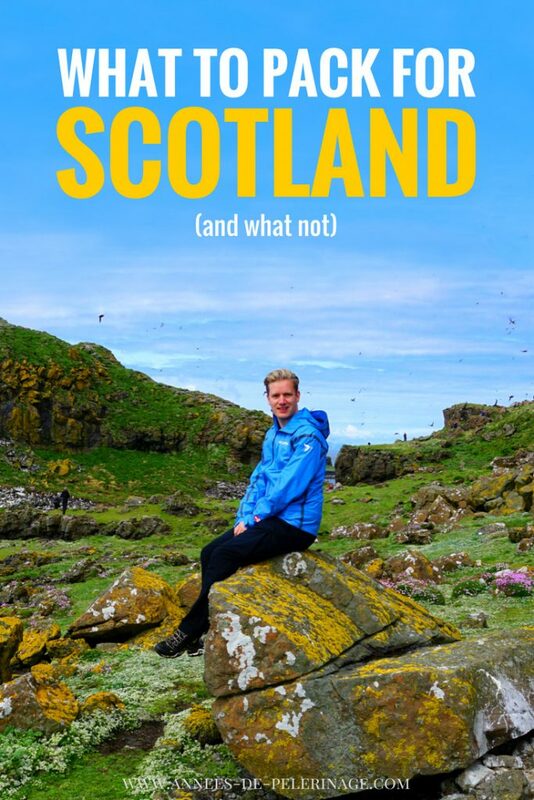 I’m heading to Scotland on 25 June 2019 for 3 weeks. Your list is very helpful.